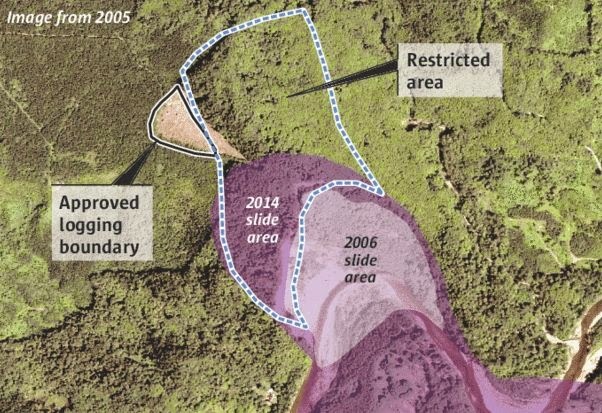 TIMES WATCHDOG: A WA forest clear-cut nine years ago appears to have strayed into a restricted area that could feed groundwater into the landslide zone that collapsed on Saturday and took at least 16 lives. 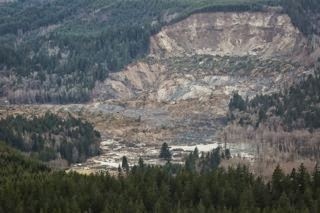 A forest clear-cut nine years ago appears to have strayed into a restricted area that could feed groundwater into the landslide zone that collapsed Saturday. A Seattle Times analysis of government geographical data and maps suggests that logging company Grandy Lake Forest cut as much as 350 feet past a state boundary that was created because of landslide risks. The WA State Department of Natural Resources is supposed to verify a timber company’s proposed cut on the ground and then reinspect the site after the harvest has been taken. State Forester Aaron Everett reviewed records on the issue Wednesday afternoon and said it appears that a portion of the clear-cut’s footprint extended into the sensitive zone. He said his agency was trying to locate records to show whether it inspected the site after it was logged. “I was surprised,” Everett said. He will investigate further before concluding whether Grandy Lake went beyond the borders. Campbell Timberlands to log on steep and unstable slopes near the Noyo River. 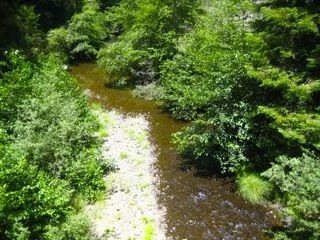 This THP is 4 miles east of Fort Bragg, CA and just north of the Noyo River at an elevation of 240 to 1,040 feet. Campbell Timberlands is planning a tractor and cable logging operation on steep and unstable slopes in redwood, Douglas fir, grand fir and hemlock forests. 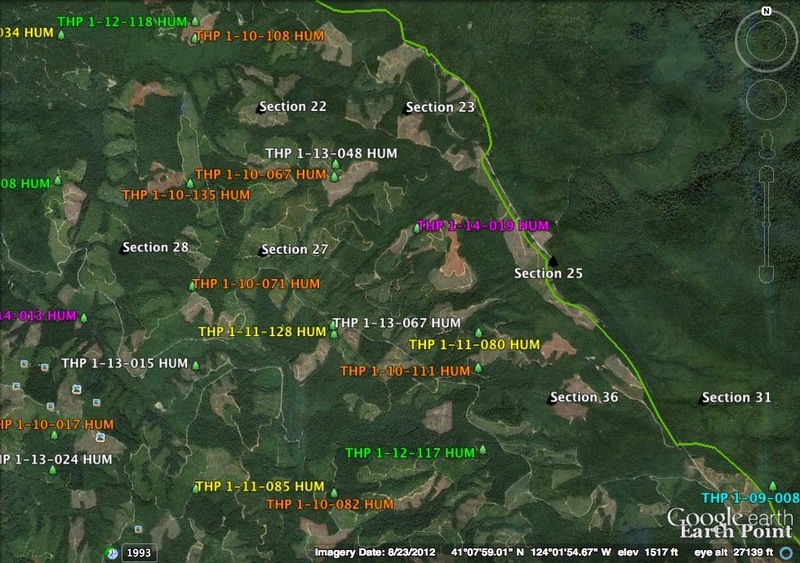 The THP area flows into the Noyo River which is listed as impaired for sediment/siltation and temperature. There are 9 landslide terrain sites including disrupted ground, debris slides, steep streamside slopes, hummocky ground and rock slides. Multiple road failure sites were reported including cut bank failures, fill failures, bank cracking and channeling of the road bed. There is also a steep headwall swale with some slope failure on slopes over 65% grade near a landing in unit C, and some cracking on the lower portion of a landing in unit F. Campbell Timberlands is planning to use and construct roads on deep seated landslide terrain in unit C, and use existing skid trails on deep seated landslide terrain in units D, E and J. Portions of units A,C,D,E,J,F and K have tractor operations proposed on steep slopes over 65% grade. They also want to use heavy equipment within a watercourse on 2 landings in unit J and between units D and E, on tractor roads within units D and J, and to construct and re-construct roads in unit C. Ground based equipment is proposed for use in areas designated for cable logging for end-lining and for tractor assist in unit F. There are 56 road drainage sites planned for work including rocking, dip construction, ditch cleaning, culvert repair/replacement and road bed stabilization. For spotted owl site MEN0500: this THP will reduce foraging habitat by -.2 ac within .7 mi, and nesting/roosting habitat by -12 ac within .7 mi. For spotted owl site MEN0087; this THP will reduce nesting/roosting habitat by -5.2 ac within .7 mi. More information is available on the THP Tracking Center website. Mendocino Redwood Company to log on steep and unstable slopes east of Navarro. This THP is about 1.6 miles east of the town of Navarro, CA and Highway 128 at an elevation of 320 to 1,400 feet. Mendocino Redwood Company is planning a tractor and cable logging operation in redwood, grand fir and Douglas fir forests. 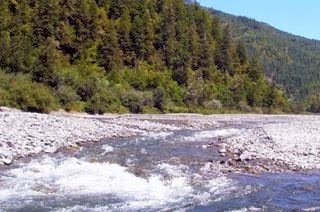 The THP area flows into the Navarro River which is listed as impaired for sedimentation/siltation and temperature. There are 15 road related failure sites including fill failures, cut bank failures, cracking and road bed channeling. Mendocino Redwood Company is planning to use an existing landing and skid roads within a watercourse, and also to use ground based equipment in areas designated for cable logging for swing yarding, to construct fire breaks, tail holds and for end-lining. 70 road drainage sites are planned for work including dip construction, rocking, culvert repair/replacement and ditch cleaning. More information is available on the THP Tracking Center website. 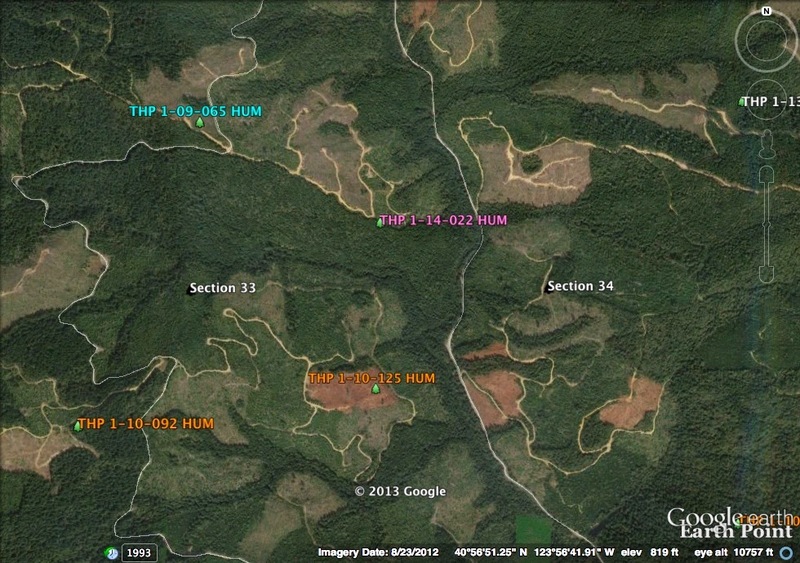 Green Diamond Resource Company to clearcut north of Highway 299. This THP is about 6 miles NE of Arcata, CA and a few miles west of the Highway 299 Coast Range summit. Green Diamond Resource Company is planning a mostly clearcut feller buncher, shovel and cable logging operation in Douglas fir and redwood forests. There are 3 shallow landslide areas located within a class I watercourse area in unit C. The THP area flows into the North Fork of the Mad River and Mad River which is listed as impaired for sediment, siltation and temperature. 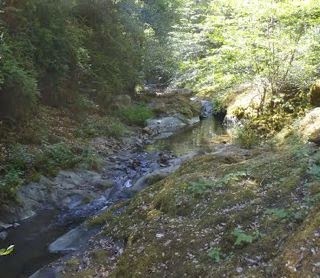 Steelhead and coastal cutthroat trout are known to occupy the class I streams adjacent to units B and C, although there are no coho salmon because of a barrier downstream of the THP area. Southern torrent salamanders were reported in unit B, northern red legged frogs were spotted in unit A, and there is del Norte salamander habitat throughout the THP area. More information is available on the THP Tracking Center website. 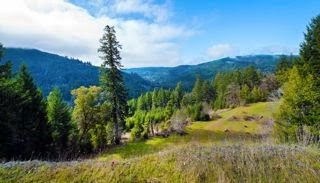 Green Diamond Resource Company to clearcut adjacent to Redwood National Park. This THP is about 8.25 miles NE of Trinidad, CA and Highway 101, and adjacent to Redwood National Park. Green Diamond Resource Company is planning a mostly clearcut shovel, feller buncher and cable logging operation in redwood, Douglas fir, Sitka spruce and Grand fir forests at an elevation of 600 to 2,100 feet. 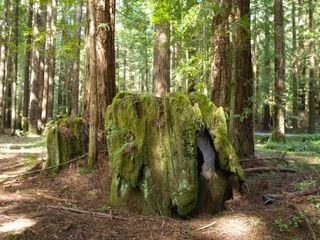 Unit C is adjacent to Redwood National Park and there is a 200 foot special treatment area to help hide the effects of clearcutting along the park boundary. Green Diamond Resource Company is planning to use ground based equipment in an area designated for cable logging within unit A. They also are planning to construct 2,500 feet of new temporary road, and to construct 3,000 feet of new seasonal road. Southern torrent salamanders were reported adjacent to unit A, and coastal tailed frogs may be present in class II watersheds within units A & B. More information is available on the THP Tracking Center website. 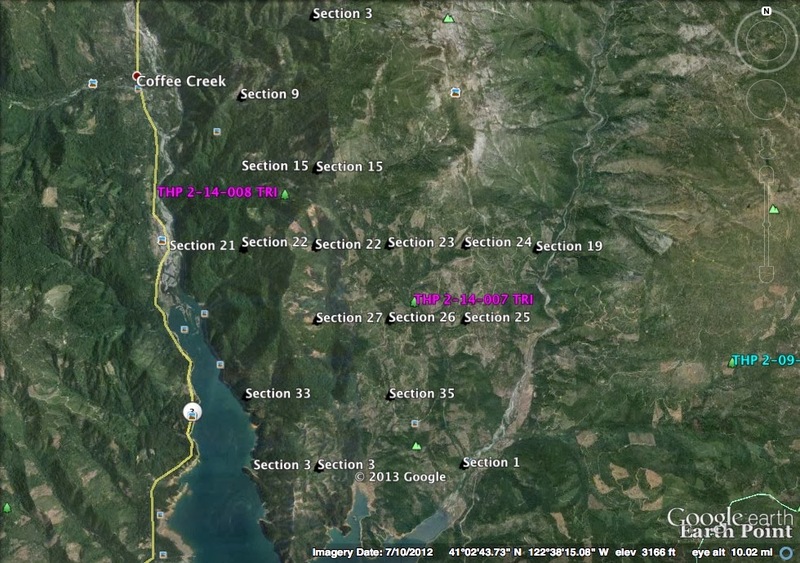 Sierra Pacific Industries planning a pair of clearcut THPs along the North shore of Trinity Lake. Sierra Pacific Industries (SPI) is proposing a pair of clearcut THPs totaling 949 acres near the north shore of Trinity Lake between the Upper Trinity River and the East Fork of the Trinity River. These 2 THPs combined will have a significant impact along the northern shore of Trinity Lake which is already suffering from excessive loads of sediment. 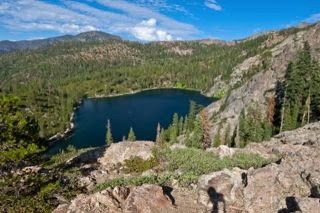 Trinity Lake is part of the Central Valley Water Project which provides drinking water to Northern California. These THPs which are interspersed will also remove a large amount of habitat near 2 Northern Spotted Owl territories. This THP is 2-6 miles NE of Trinity Center, CA near the north shore of Trinity Lake at an elevation of 2,400 to 5,000 feet. Sierra Pacific Industries is planning a mostly clearcut tractor and cable logging operation in Douglas fir, ponderosa pine, white fir, sugar pine and incense cedar forests. The THP area drains into the north shore of Trinity Lake between the Upper Trinity River and East Fork of the Trinity River which is listed as impaired for sediment and siltation. At least 5 unstable areas are indicated on THP maps (SPI THPs are notorious for not fully disclosing information about unstable areas within the text of THP documents). SPI is planning to reduce the width of a class I watercourse protection zone below the standard width inside unit 2056. They also want to use tractors on steep slopes up to 60% grade to construct fire lines within units designated for cable logging. There are 6 oversized units, and over 3,350 feet of temporary seasonal roads are planned. Section 19 is adjacent to the Bonanza King Roadless Area. 7 sensitive plant species were reported within the THP area including: Shasta County arnica in units 6037, 6104, 2068, 2036, 2037, 1949 and 1913; lemon colored fawn lily in units 6037 and 1913; slender false lupine in units 6037, 2068 and 1983; tauchia glauca in unit 6037; English Peak greenbriar in unit 1913; Sierra Valley lewisia in units 1980, 2026 and 2036; and Klamath Mountain catchfly was found in units 2026 and 1960. This THP is 2-6 miles NE of Trinity Center, CA near the north shore of Trinity Lake at an elevation of 2,440 to 5,000 feet elevation. 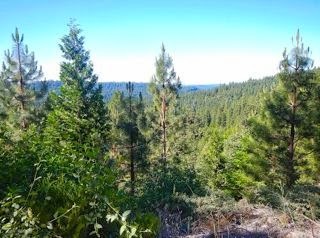 Sierra Pacific Industries is planning a mostly clearcut tractor and cable logging operation in Douglas fir, ponderosa pine, white fir, sugar pine and incense cedar forests. The THP area drains into the north shore of Trinity Lake between the Upper Trinity River and East Fork of the Trinity River which is listed as impaired for sediment and siltation. At least 4 unstable areas are indicated on THP maps (SPI THPs are notorious for not fully disclosing information about unstable areas within the text of THP documents). SPI is proposing to use tractors on steep slopes up to 60% grade to construct fire lines within units designated for cable logging, use tractors on steep slopes designated for cable logging within units 1740 and 2018, and to use a tractor inside unit 2018 to construct a skid trail on slopes over 50% grade with a high erosion hazard rating. They also want to use a portion of a landing inside a class II watercourse, a skid trail close to a class II spring, and an existing road inside a class II watercourse. 22 road drainage sites are planned for work including rocking, dip construction and culvert repair and replacement. There are 4 oversized units, and wet areas located in units 2014, 2018, 1486 and 1495. Siskiyou onion was found in unit 1478; Shasta County arnica was found in units 6005 and 1478; lemon colored fawn lily was found in unit 6005; Sierra Valley lewisia was found in unit 1478; Klamath Mountain catchfly was found in units 1478 and 1461; and slender false lupine was found in unit 6026. More information is available on the THP Tracking Center website. FGF US Forest Holdings to log on steep and unstable slopes near Redwood Creek and Highway 299 summit.